As thousands of teachers in Colorado prepare to rally at the state capitol this week, it's been widely reported that the state ranks 46th nationally in teacher pay. DENVER — Every major media outlet in Denver has gotten something wrong. As thousands of teachers in Colorado prepare to rally at the state capitol this week, it's been widely reported that the state ranks 46th in teacher pay, with an average of $46,155 a year. We cited that figure on Next this week. It’s also appeared in the newspaper, on every local television station, and in national reporting on Colorado. But that's not accurate, according to the latest data from the National Education Association, which provided the original statistic. 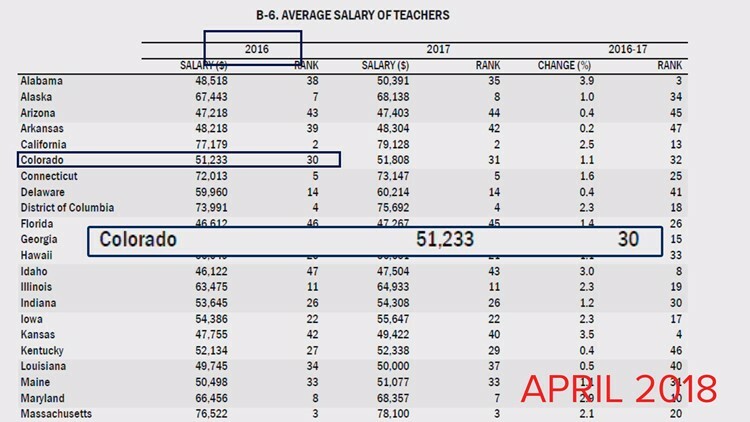 The NEA ranks Colorado at 31 for average pay in a report dated April 2018, meaning Colorado teachers are far closer to the middle of the pack when it comes to pay. The number from the national teachers union is often cited in debates about education funding in Colorado. On Wednesday, students at Lincoln Elementary in Denver made an enormous banner citing the statistic. However, the underlying numbers were quietly revised, a change first noticed by The Denver Post. The NEA tells 9NEWS that the State of Colorado provided the revised numbers. 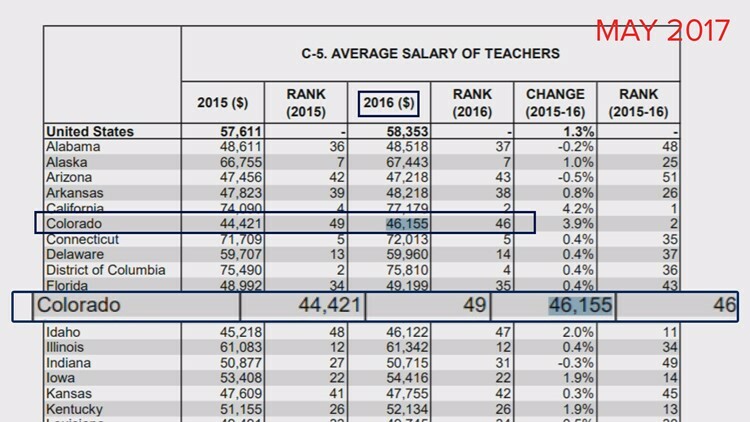 Colorado's teachers didn't make an average $46,155 in 2016, the report says. They made 11 percent more - $51,233 - giving them a rank of 30th in the country. That rose to $51,808 in 2017, but they moved down the national list by one. The most recent report can be found on the "Rankings of the States 2017 & Estimates of School Statistics" 2018 page on the NEA website. Here is the direct link to the report, and here is the link to the previous report, to compare. And no, this figure does not reflect other factors, like the average cost of living in each state or county, or the number of students per teacher, or funding for schools. This is simply a correction of one figure that you will hear more of this week.